Magic Band+ is a free music app for Windows 8 and 8.1. When you run the app on your device, you will straight off be taken to its main menu. 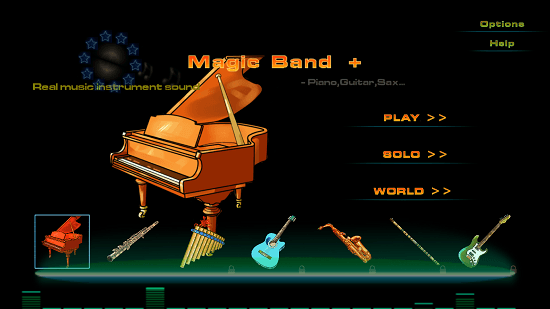 The game when installed and run on your device will allow you to choose the type of instrument that you wish to play. In the game, you have to press and hold the moving notes as soon as they hit the green line. The game works well on touch screen devices, although you can also use it on a non touch device via either a mouse or for more precise control on a faster track, you can use your spacebar key to hit the approaching notes as they move past the green indicator line. The responsiveness with which you will hit the notes allows you to make a high score. Magic Band+ is available for free from the Windows App Store. As I already mentioned in the intro of this review, the game when launched directly brings up the main menu. This looks like the screenshot below. You can select the instrument which you want to play by clicking on its icon at the bottom of the screen. Once you have done that, you can click on the Play button to be taken to the song selection screen. 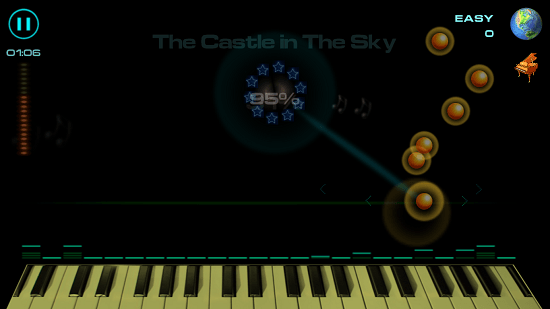 Although the app has a large number of instruments that you can choose from the bottom of the screen, the gameplay technique is the same – hitting the notes as they move past the green line either via touch controls, keyboard controls or by means of the spacebar. 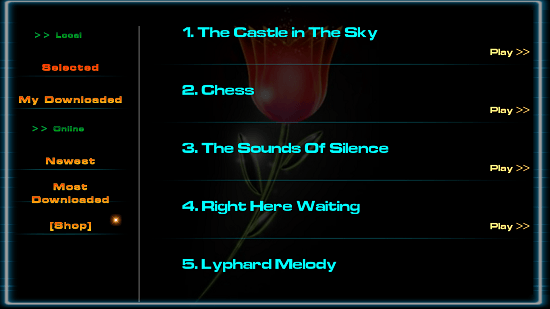 The song selection screen is shown below. Simply click on the Play button in front of the desired track to play the particular song. The gameplay interface is shown below. The notes will glow when they approach the green line. If you hit them as soon as they approach the green line, you will be awarded 100% of the per note score. If you are too fast or too slow, you will be awarded a considerably less score. Once the level is completed, you will see a screenshot as displayed below which shows you your score. 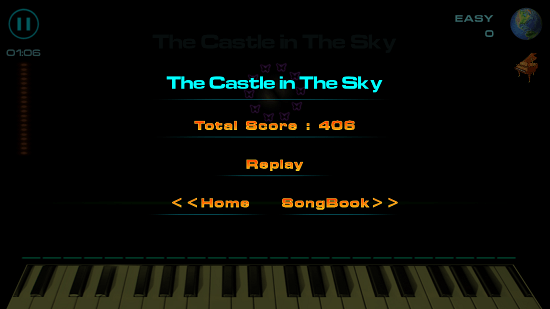 From the screen shown above you can choose to either return to the main menu or choose to play another song. Magic Band + is a well designed music game app with a large collection of songs that are sure to keep you entertained at all times. You can get this game for free from the link below.